This years Mitsubishi Motors Badminton Horse Trials have been coined the “most dramatic” Badminton yet. And as any eventing enthusiast will tell you, the real action happens on the cross country course. This year at Badminton was no different. Held every year in Badminton, United Kingdom, the horse trials have become synonymous within the horse world as being a faced paced horse trials, testing the skills of some of the world’s most elite horse and rider athletes. In typical English fashion, the weather was a focal point of conversation. The morning started with high winds and rain lashing the course, leaving the footing soggy and hard going. Although patches of sun shone through the intermittent rain showers, winds were unrelenting in their battering of spectators and riders alike. The weather no doubt played a substantial role in the drama that unfolded. The fences were tall, the spreads wide, the gallops long. The layout of the course meant for great opportunities for spectators to watch their riding idols gallop by, but lent itself to very tired horses and riders by the end. With 30 fences to tackle and a 3.5 mile course to make it around, the course began claiming victims early in the afternoon. Fence 5, the Savills Escalator, proved a difficult combination for many riders. A wide spread followed by two skinnies on a downhill slope, it caused a number of refusals and run outs. Fence 13, the Outlander Bank, saw top U.K. rider Mary King come within an inch of a fall, barely clinging on to Imperial Cavalier’s neck as her 16.2 hh mount struggled to regain his footing. Only a few fences after her recovery, Mary retired from the course. She has since announced intentions to retire Imperial Cavalier from 3 day eventing. Another top rider to not make it through the Badminton 2014 course was William Fox-Pitt, who fell towards the end of the course at the daunting Countryside Hedges. 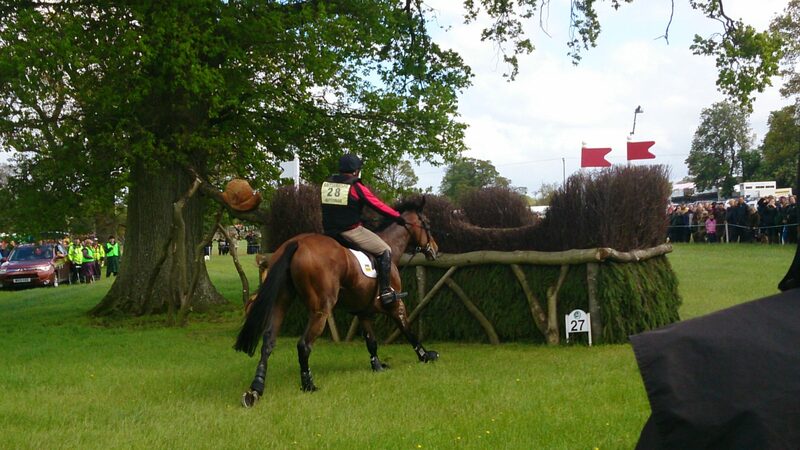 His fall was indicative of the test of endurance and skill that both horse and rider had to endure at Badminton 2014. For those of us in the crowd, the day was marked by audible gasps of breaths, hesitant clapping and whoops of encouragement as riders barreled their way through the course. Paul Tapner finished at the top of the leaderboard following a tense, yet successful, round on the course. Watching him navigate the soggy terrain astride the beautiful and majestic Kilronan was definitely a highlight that I will not soon forget. Overall, the drama and action that was Badminton 2014 will go down in eventing history. No other event has seen so many top riders fall or not complete a course. One can only speculate had the weather been different, would the course have ridden better? I guess we’ll never know! Andrew Hefernan about to tackle the massive spread that claimed William Fox-Pitt. Fueling your growth: in-house or marketing agency?